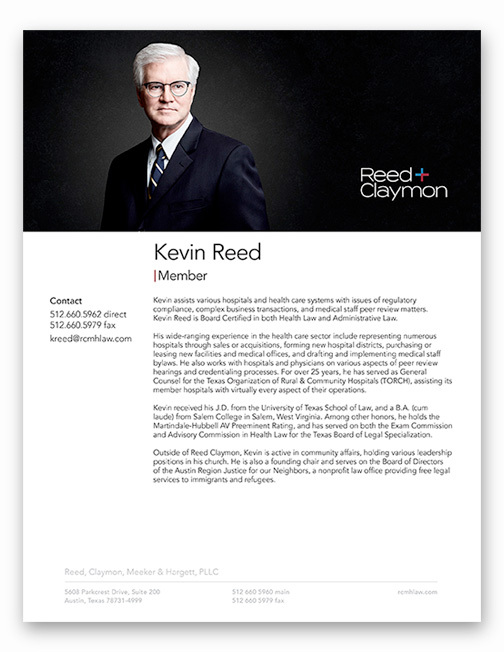 We were contacted by Reed Clamond as they began their search for a firm that could handle rebranding their growing legal practice. 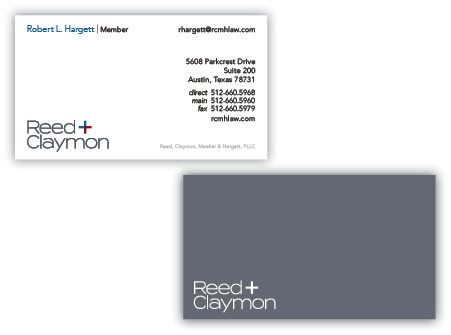 Reed Clamond is an Austin based law firm that specializes in health law. A fair amount of their work being done for rural hospitals and medical practices. The scope of the project perfectly fit our capabilities as their most needed services drew from our natural strengths. We worked closely with the firm as we engaged on delivering the following creative. What we do best is understanding who you are and how you work and then discerning the best visual approach to represent the best that you have to offer. Reed Claymon benefits from this effort and is more strategically positioned to move into the future. Do you think we are a good fit? Contact us today and let’s talk about your needs and budget. You’ll be amazed at what we can do. Stationary design? Yes, we’ll knock your socks off. Corporate photography is at the core of our visual branding efforts.